We had a dinner party the other night and it was revolved around seafood. I dressed the table in a pretty turquoise tablecloth. I used my plates from Kohls. I added some netting to make it look more beachy. 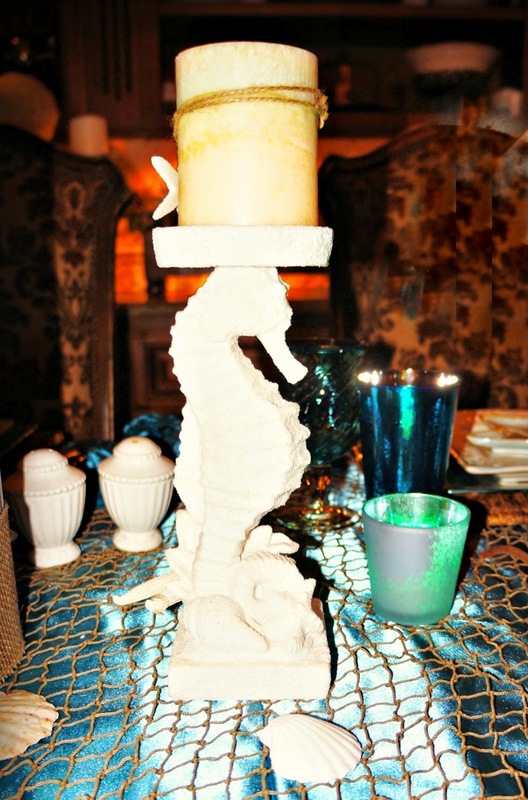 I also bought this cute seahorse candle holders at Kohls. I created two water towers for the table. I hot glued some burlap around the bottom of the vases and added a starfish. Inside, there is colored marbles, a tropical scene and shells. My husband added a few drops of blue. I finished them off with white floating candles. They made an awesome display of lighting. Pier 1 is where I found this beautiful pieces. Salad bowl and pitcher. I will share the recipe I made soon. Cajun Seafood Pasta. The dessert was Chocolate Yummy. 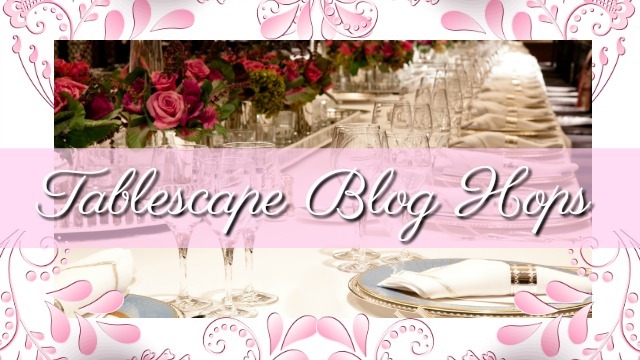 You may have noticed I changed my blog theme again. Gotta love Fall! I may be tweaking things here and there in the next couple of weeks. I also have a new blog design to show you. Mama Jax's blog, a very talented artist who lives in New Orleans. Ron from Uptown Acorn referred her to me. Thanks so much Ron. How much fun is that. I'll be the guests were blown away by the color and the theme! 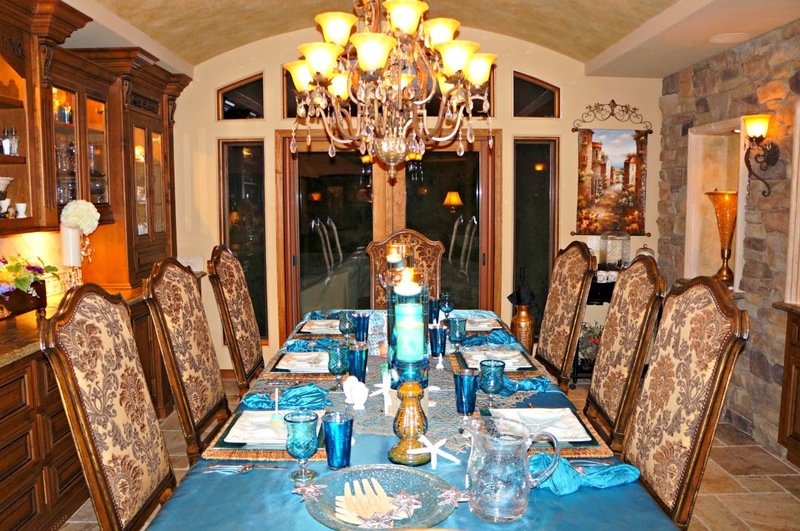 Well..you have lucky guests..Nothing is harder to photo than an indoor table w/ lights..away from natural light. I would not only need a new lens. I have 3 of those tall vases/I bought them over 15 yrs ago..for exactly the purpose you are using them for..Do you think I can find any round floating candles anymore ? Not 1 round.. candle can be found. I see pink roses yellow flowers..no nice white round candles. I like putting fall things in the vases.. vines..etc.. I've seen the round floating candles at Target, Walmart and Hobby Lobby. Sometimes they are in the wedding dept. Good luck! This is such a pretty tablescape! That turquoise tablecloth sets the stage for an elegant beach look! Beautiful, Linda, as always. I absolutely love the bold color that you have used. I LOVE your dinner parties and will be sitting right here waiting for those recipes!!! 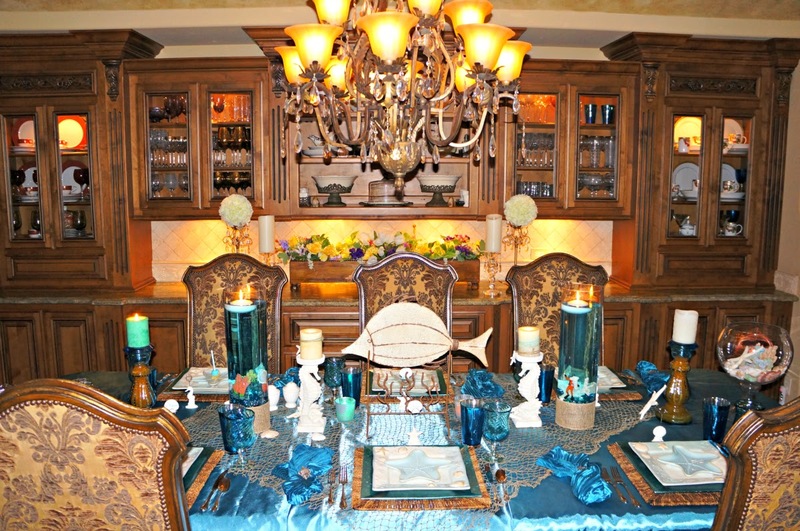 Your guests must feel very special to sit at your table...I love aqua tablescapes! Gorgeous, Linda. Those are the cutest candle holders. Wow I love the theme and colors you used. The shiny tablecloth material looks like water- the water towers you created are cute and the fishnet really pulls the sea theme together. Those plates are perfect for this and the stemware is beautiful. 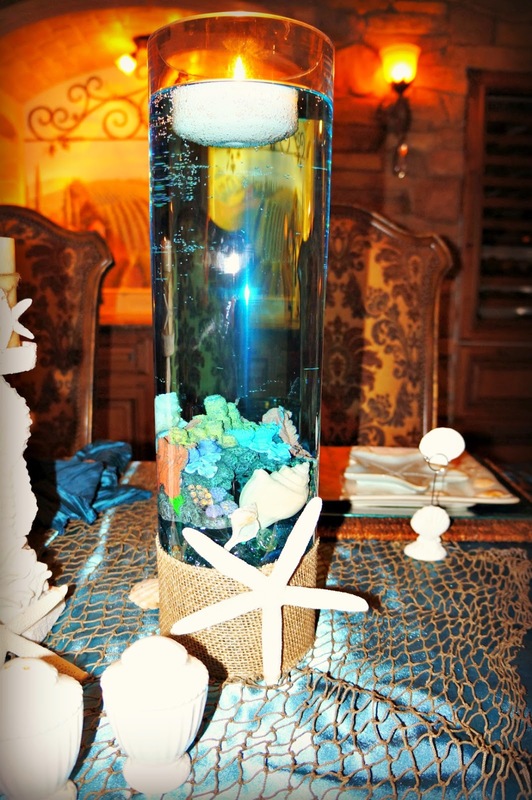 I bet it was a fun gathering- especially with this themed table! Love the table-scape, and the dishes are so pretty! 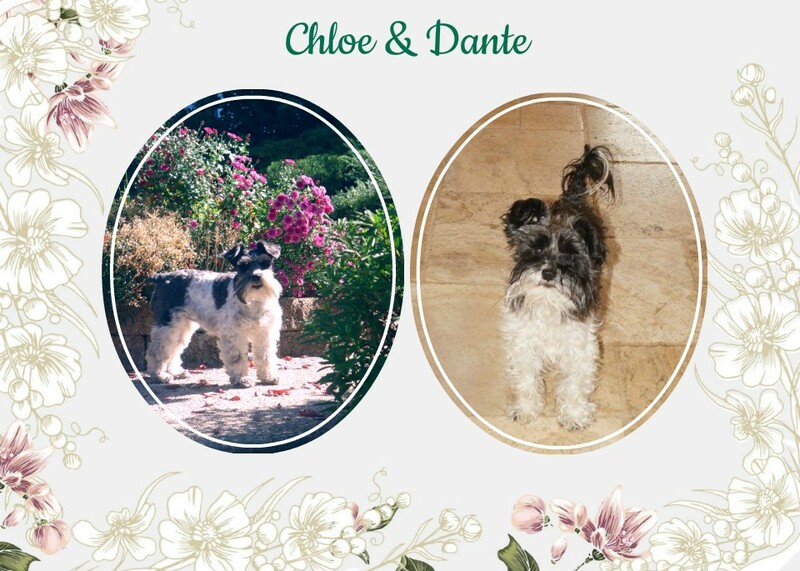 Thank you for the visit to my blog, and for following..... I appreciate it. I am now following you as well, and looking forward to reading more of your posts! 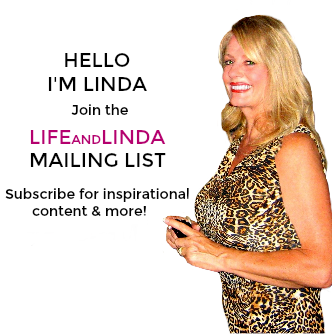 Sweet Linda...first and foremost: 'you look gorgeous in your new picture'...so young and beautiful! I'm so happy you look wonderful and are feeling so well. 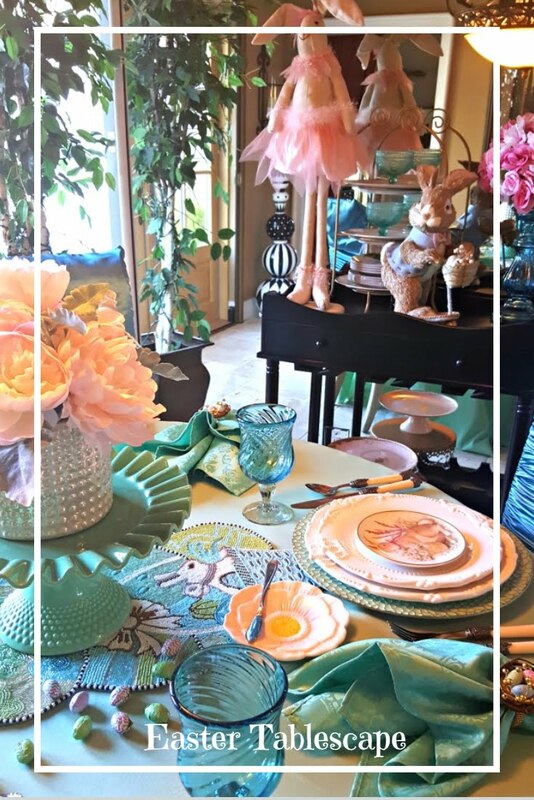 Your turquoise table topper and entire table I'm sure was a hit with your friends as it is stunning! Thanks for coming pretty lady. Gorgeous table, Linda!!! 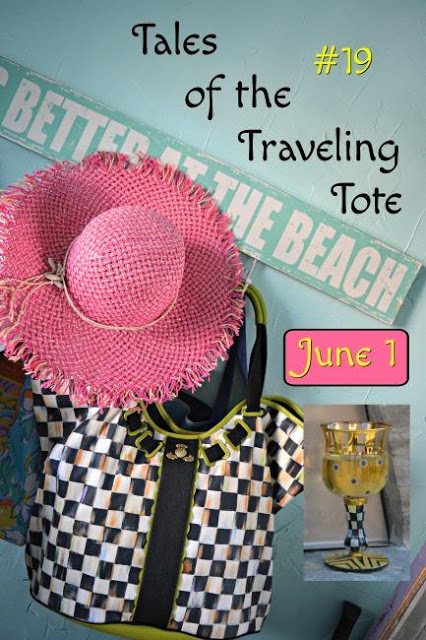 Love the beach theme and your beautiful accessories. Look forward to the recipe!!! What a table, Linda! The netting really adds that beachy look and those cylinders are spectacular. I can just picture them all lit up. What a spectacular table! Love the colors! The entire room is so pretty! Hi Linda, I am in love with this tablescape. The color and all the details are beautiful. Your guests must have been raving. Your home is just gorgeous!! The blue is stunning, as is the room. Love the chandelier. Thanks for stopping by and following along on my journey. I'm always happy to return the follow and look forward to browsing around on your blog. Oh Linda, first of all, aqua is my very favorite color and second, beach tablescapes are my favorite! Where did you ever find those aqua glass mosaic like chargers? Gorgeous! Love your water towers too! There's nothing more than I like any better than a beach theme. So very pretty. Thanks for stopping by White Lace and Promises. I just checked, I've been Your follower for a long while.Sorry I didn't recognize Your blog.I don't think it shows up on My blog roll very often. Beautiful! The netting is an especially authentic touch! Wow, this is quite the table. Love the colors and those cylinders with the candles. Very nice. Lovely and fun table. Also love the plate stack....you have some very neat coastal pieces. Glad to hear you are doing well hon.........Thanks for answering back today. Linda I just died for this tablescape, it's so fresh and breezy, the color scheme reminds me of the blue ocean water from the beaches I used to frequent as a child so inspiring..... Great job. 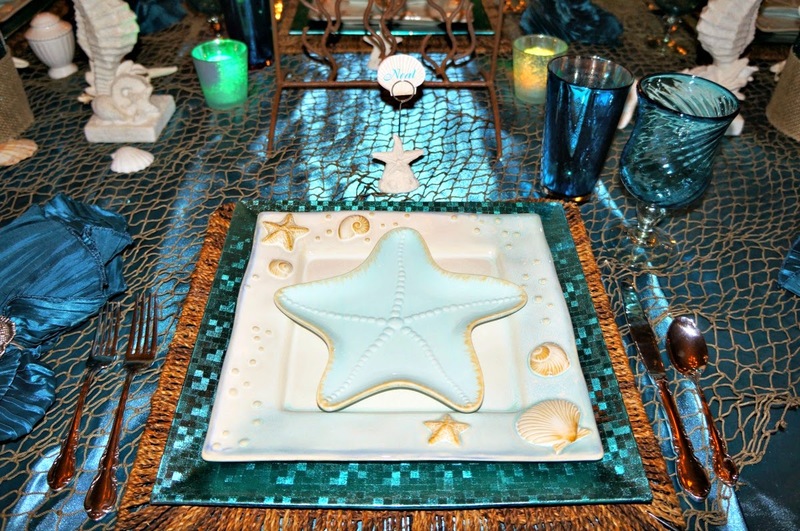 I LOVE THAT STARFISH PLATE! And the aqua colors are of my favorite shade. I could live with this theme any time of year! Ooo....I love your new header! Wow! What a fabulous dining table! The colors and details are awesome. 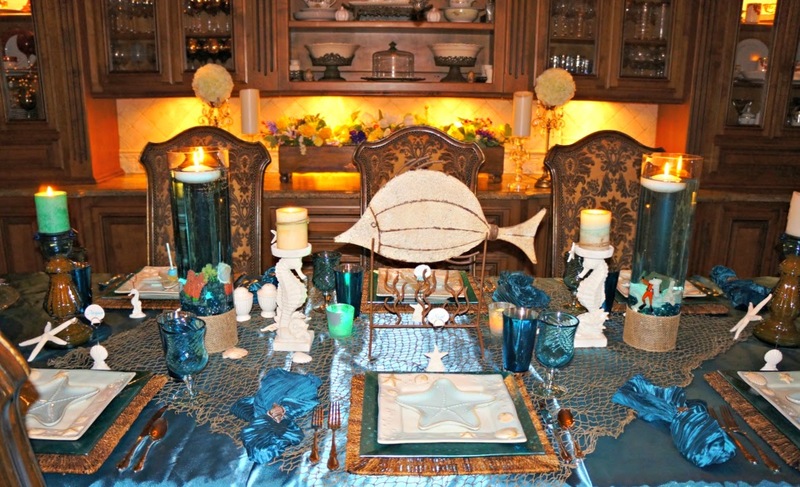 I love how you used the fish net to give that earthy or shall I say "seaworthy" look to the table. Everything came together perfectly Linda, but then your tables are ALWAYS masterpieces!! What a beautiful table, Linda! Love the turquoise...I bet it's really gorgeous with candlelight! The water towers are great addition...very creative! 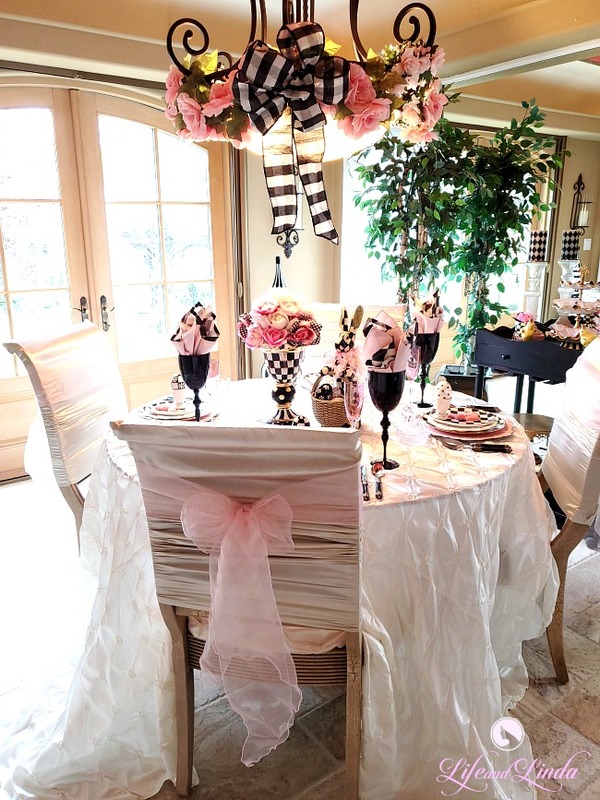 Love, love your tablescape, Linda! Gorgeous! You always put together the prettiest tables! Your table is just stunning. What a beautiful job you did. 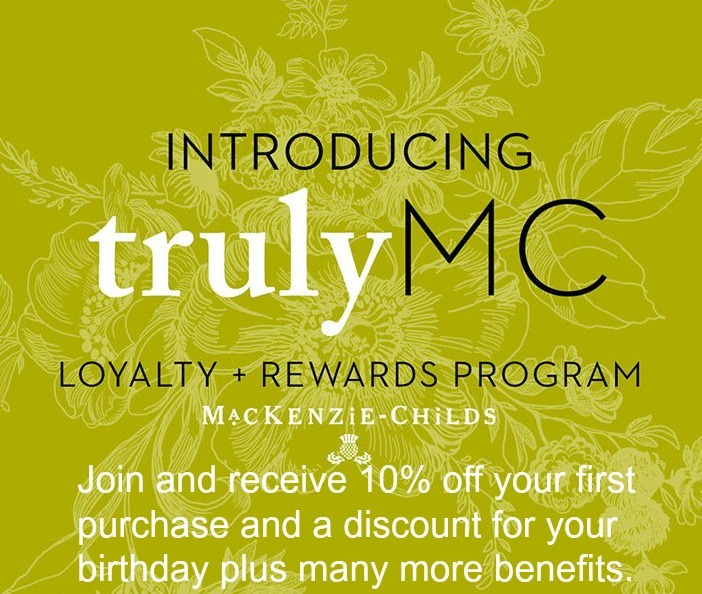 I know your guest loved every bit of it. Your photos are lovely...I've been told to never use the flash...and I do my photo editing in PhotoScape...they have just about anything you need to lighten photos that might be too dark, to sharpen the photo, just so many things and it's fun....course, PicMonkey is wonderful, too. Hi Linda, what a gorgeous tablescape. You are so creative, how lucky to be a guest at your home. Fabulous! You are really creative Linda. 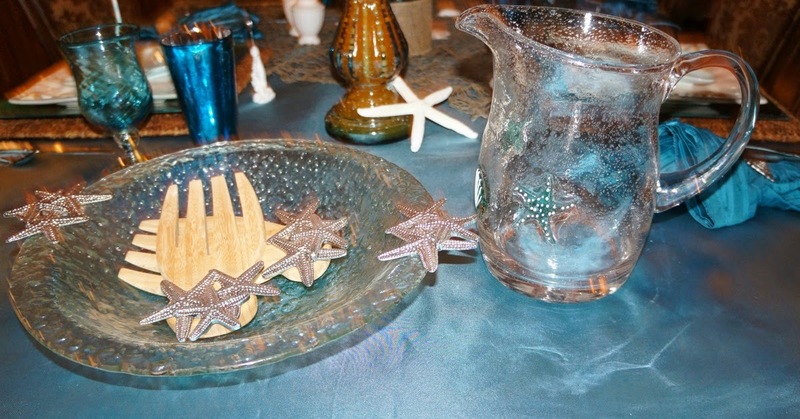 I love this seaside dinner party theme, really cute and fun! I love the idea of the net and the candles and plates are really funky. You know how to host parties Linda. Well done! I don't care for seafood, but I *LOVE* your table setting. That turquoise is beautiful.